Q. There are many carnival suppliers on the internet. Why choose Carnival Savers? A. Owned by a mother with school aged children, Carnival Savers was founded to help volunteers run a successful carnival. 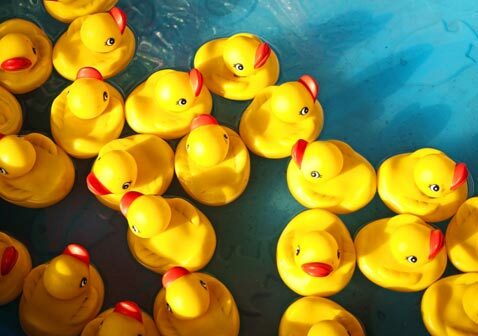 We offer more than 1000 different toys, prizes and carnival supplies at low prices - compare for yourself! In addition, we provide Free Carnival Booth and Carnival Game Ideas with detailed instructions to be sure that all booths turn a profit and are great fun for kids. 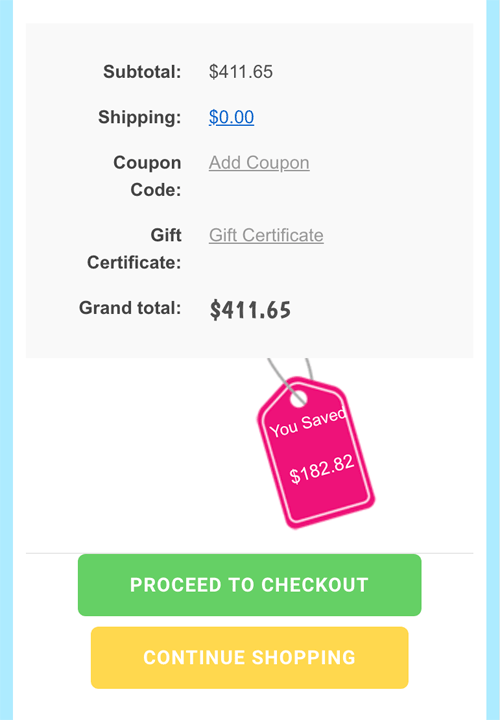 We strive to be very competitive on price and are happy to show you your savings on comparable products - check out your savings on each product in our store AND when you view your cart, see our Hot Pink Savings Tag on the shopping bag / cart page for your total savings on comparable items from other online stores to see how much you have saved! We believe that friendly, fast service is what every business should offer and we will do our best to help you in any way we can! Some novelty products just don’t work. We know, we have had tops that don’t spin, yoyos that get stuck, and pens with blotchy ink. We did the research for you – all of our products have been tested to work and come with our Carnival Savers Guarantee. Using any internet connection on a smart phone, iPad or computer, you can see the status of your order 24/7! Q. Do you have a print catalogue you can mail to me? A. Currently, we only have an online catalogue and do not have a catalogue in print. This helps us to keep our cost down and our prices low and give you some advantages too! In addition, you can see when we add new products and if something is sold out or discontinued, we remove it from view so you are not counting on items from a catalog that are no longer available. Q. Do you sell to the general public? A. Yes we can sell to anybody but we do have a $50.00 Minimum Order. Q. 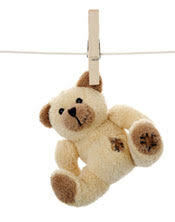 Do you accept School Purchase Orders or PO's? A. YES we do - as long as you can pay us within 30 days of placing your order, and we ship directly to your school! Simply use our online shopping cart and once you have everything you need in your cart, click the green "Proceed to Checkout" button just like you would if paying with a credit or debit card. Make sure your have your name and contact information on the order too just in case we have a question. 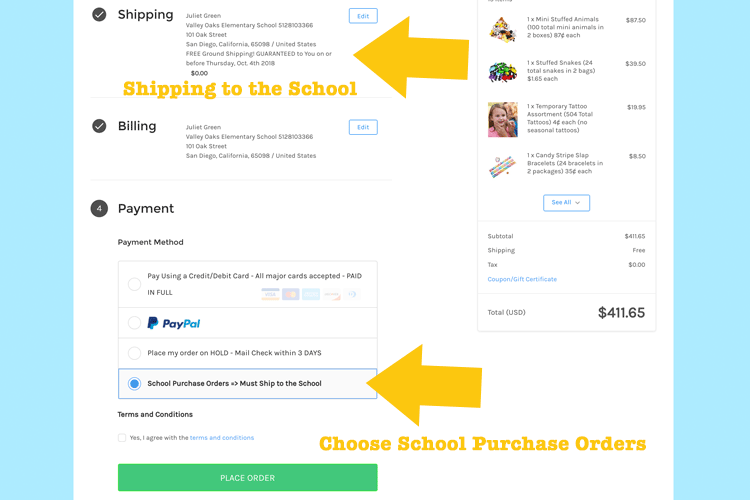 When you are done simply choose the School Purchase Orders option under step #4 and then hit the "Place Order" button and we will have your order and begin processing it! NOTE: if you need to have your PO number on the invoice - simply add your PO number in the comment box that is available in the shipping area when you are going through checkout. Q. We are Tax Exempt. How do I remove taxes from my order? A. First, the good news we only charge taxes if you live in Texas - so all others are tax exempt automatically! For Texas customers, please send us your tax exempt form click here to download your form. If you have a smart phone, you can even take a picture of your filled out form, and send a medium sized copy to tax@carnivalsavers.com. Q. How many days will it take for me to receive my order after it has been placed? A. Our goal is to ship out your order with 2 - 3 business days after we receive your order. Not to worry, we have a team that watches our orders carefully so you are sure to receive your order when promised on the website, or your shipping is FREE! All orders are shipped from Omaha, Nebraska. Q. How many students should I plan on attending? This is our first year and our school has about 600 students at our school? A. Participation in past events can give you a cue as well. Remember, many of the children attending will bring their entire family - including younger and older siblings. And some parents participate too - many love the cake walk, large slides and other games that may try to win a prize for their child. With that said, use some estimated guessing, you may wish to ask the PTA, PTO and others to help you come up with a number of children to plan for. Remember, extra toy prizes can be used next year in the Grab Bag Booth. Extra candy prizes could go to other events that are within 6 months. (Candy should not be saved until next year – it should always be purchased just before your event). Q. How many prizes do I order for each booth? A. A great question! First, estimate the number of children attending your carnival. Next, keep in mind that some booths are more popular than others. At our school, the game booths or any booth were children can win a stuffed animal seems to draw in a crowd. So, we have more prizes figured for those booths. In general, take the estimated number of children attending and increase it somewhat. For example, if you believe that you could have 500 students attending your carnival, have enough prizes for 550 - 600 players for popular games. Some children will play a game more than one time to win that special prize and others may not play at all. Hint: after this years carnival, count the tickets collected at each booth, divide by the number it took to participate and you will better know how many to count on next year! Q. We ran out of tickets last year - :( How can I make sure I have enough? A. We have seen many big events order just a few rolls of tickets thinking that with 2000 tickets on each roll - it just sounds like you will have more than enough! Well, nothing is more frustrating that running out of tickets in the middle of a big event - ask us how we know!?! Anyways, we just added a FREE Online Ticket Calculator to estimate how many tickets you will need either by estimating visitors or using the amount of revenue collected from a past event. 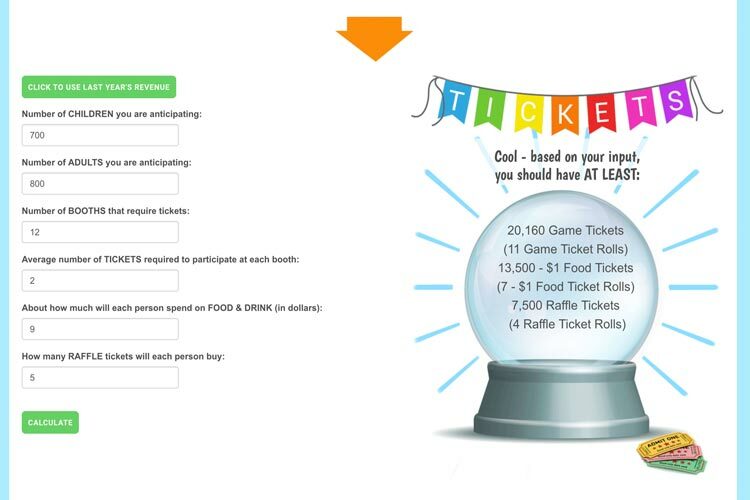 Click her to check it out or read our blog post for more hints and tips about determining how many tickets you need! Q. How can I setup the game and activity booths to help us turn a profit? A. Make sure that the prizes are well under the amount that is charged to play the game. For example, if you are charging 50 cents to play a game the first and most common prize should be about .10 cents or lower. The second could be .20 cents or less. The top prize could be .50 cents or less – but remember, the top prize should be given to about 10% – 20% of the players. Q. What do I do with the varied assortment of left over prizes from last years fair? A. We have several suggestions - check out our Blog Post called "Wait Don't Throw Out Your Leftover Carnival Prizes"! We give some easy suggestions and even talk about about having a Grab Bag Booth next year. BUT, be sure to read the SECRET SAUCE to making the grab bag booth popular with the kids or it will be a bore! A. Here are Carnival Savers we understand the payment needs of our customers -- we have 4 easy ways for you to make payment! Since 20113 All orders can use our easy online shopping cart and send us your order electronically! Simply fill up your online cart and go to checkout. When you get to the "How Would you Like to Pay?" choose the method that works for you!! 1. Order Online using our Secure Server and Pay with Your Credit Card or Debit Card. When ready to check out, you may pay using a credit card, or debit card. In just minutes your order is complete and will begin to process! 2. Order Online for School Purchase Orders and mail your check within 30 business days. We must ship directly to the school and if this is your first order with Carnival Savers, your order may be delayed 1 business day while we verify your order information. Mail your check to: Carnival Savers 12400 W Highway 71 Suite 350-385 Bee Cave, TX 78738. 3. Order Online and Mail Your Check. We will Hold Your order while you mail your church or school check. Note: shipping is delayed until we receive your check - please mail your check in 3 business days! Please include your order number so we can quickly match your payment to your order. Make your check out to: Carnival Savers and mail to: 12400 W Highway 71 Suite 350-385 Bee Cave, TX 78738. 4. Order online and Pay with your PayPal Account. A great payment method for PayPal members and especially for PTA's and PTO's! In just minutes your order is complete and will begin to process! Q. Do You ship to AFO APO Addresses? A. Yes we do!! We ship via Priority USPS for Military addresses -- shipping generally takes about 2 1/2 - 3 1/2 weeks depending on your location. Just add items to your online cart and go to the check out. Choose United States as the location and then you can choose the "Armed Forces" Location as your "state" and check out as ususal! A. We do not share, sell, or rent individual personal information with anyone without your advance permission or unless ordered by a court of law. Information submitted to us is only available to employees managing this information for purposes of contacting you or sending you emails based on your request for information and to contracted service providers for purposes of providing services relating to our communications with you. In addition, we may contact you about specials, contests or request help on a customer service survey. You may contact us via e-mail, Fax or phone at any time and request that you are removed form our list. We will honor that request.